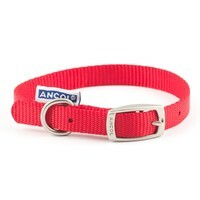 Ancol Heritage Nylon Dog Collar (Red) is an exceptionally durable and strong collar, made out of the best quality Nylon webbing. Particular attention has been given to ensure that the high standard of sewing overlaps the ends of the collar to give extra protection from fraying, making this one of the best nylon collars available. There is also a heavy duty buckle, a large solid D ring for lead attachment and evenly spaced eyelets for a lasting and comfortable fit.